My son, Troy Pino, 30, died in University Hospital in Albuquerque, New Mexico, on June 11, 2002, following a brutal physical assault by a girlfriend’s ex-husband. The assault occurred on June 7, when Troy, who resided in Las Vegas, NM, was visiting a girlfriend, Hope Lucero, at her home in Santa Rosa. Several of Hope’s relatives and friends were also at the apartment complex, drinking and partying. Reportedly, Troy became intoxicated and was making a nuisance of himself, badgering Hope’s 14-year-old son, Eddy Jr. This was not typical of Troy, who was usually wonderful with children, and whose own little girl, (born when he was 20), was his pride and joy. When his common-law wife left him, taking the child with her, Troy was devastated. What had previously been a problem of occasional binge drinking appears then to have escalated, especially when he was in the company of party people. Troy was not threatening young Eddy or physically abusing him, just mumbling incoherent comments, which made the boy uncomfortable. Eddy Jr. responded by phoning his sister and asking her to pick him up and take him over to her house. The sister called Hope’s ex-husband, Edward Lucero, (Eddy Jr.’s father), against whom Hope had taken out a restraining order. That restraining order had recently expired. The sister also called Ed Lucero’s nephew, Justin Anaya, a member of the Santa Rosa Police Department. Eddy’s father, Edward Lucero, arrived first, accompanied by a friend, Paul Gonzales, (a convicted felon who was dating Eddy Jr.’s sister). The two men entered Hope’s apartment without permission and launched an attack upon Troy, who, being intoxicated, could offer little resistance, particularly since Edward Lucero weighed 260 pounds. Lucero knocked Troy to the floor and kicked him repeatedly with steel-tipped shoes. Three Santa Rosa Police officers then arrived at Hope’s home. The two who filed reports state in those reports that they were “dispatched,” but according to Police Chief Jesus Roybal, there are no dispatch records for that evening. The first officer to arrive was Ed Lucero’s nephew, Officer Justin Anaya, who at that time was not a certified police officer. The second to arrive, Officer Anthony Ortega, was not certified either. The supervising officer, Officer Joe E. Martinez, arrived somewhat later. He is Edward Lucero’s best friend. The arrival of his nephew seemed to make Edward Lucero even more violent, and he switched from kicking Troy to slugging him with his fists. Although Troy was calling out for help, Officers Anaya and Ortega made no attempt to stop the assault. Instead, Officer Anaya sprayed Troy in the face with mace. Finally, Officer Joe Martinez arrived and terminated the assault by physically restraining his friend, Ed Lucero. No arrests were made and no charges were filed. The police did not take Troy to the hospital, two miles away, for examination after the assault. The following day, when Hope Lucero and Eddy Jr. were leaving their apartment to drive Troy back to Las Vegas, they were pulled over and detained without cause by Officer Joe Martinez. Officer Martinez made Troy exit the vehicle and told him that he could not be in the presence of his girlfriend’s son, despite the fact that Eddy Jr. was accompanying Troy and Hope of his own free will. 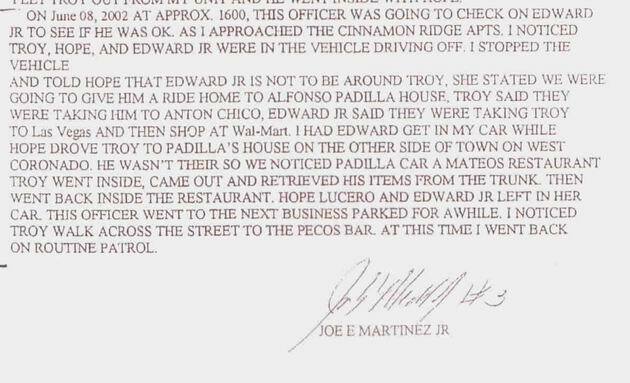 Martinez made Hope and Eddy Jr. drive off, leaving Troy stranded, which was a clear violation of the trio’s “right of association.” He, then, placed Troy under unauthorized surveillance. That, too, was totally illegal, as there were no official complaints filed against Troy by anyone. 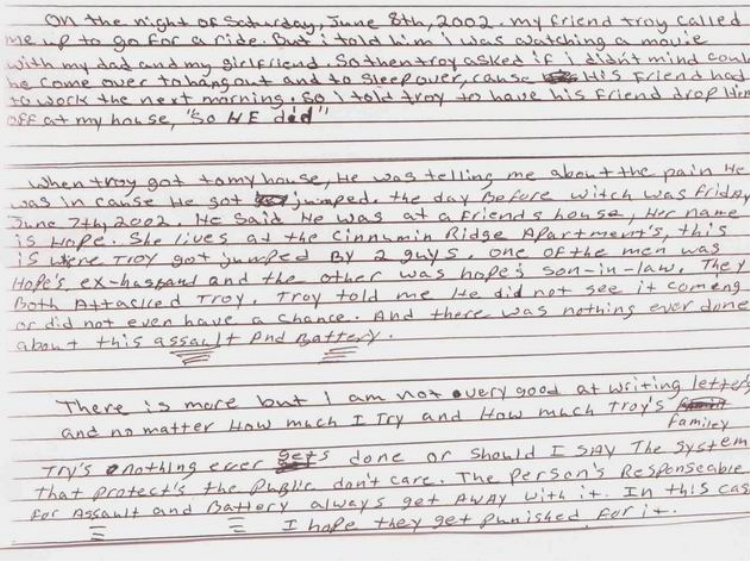 The fact that Officer Martinez has admitted in a written report that he continued to follow Troy for quite some time after Hope drove off causes us to wonder if the police may have done something to Troy that evening to remind him that they were in control. Otherwise, why would they watch him? Troy spent the night with a male friend who lived in the area. The following day, that friend noted a failure in Troy’s health and called the local EMTs. Troy was admitted to Santa Rosa Hospital, spitting blood, and with an irregular ECG and severe "high panic" potassium levels resulting from a muscle breakdown. In the emergency room, he described the assault by Ed Lucero to the attending physician. (The Emergency Room report was altered by blackening out the words "'beaten up' by some nameless people" and replaced with "'hit' by some nameless people”.) On June 9, Troy was air lifted to University Hospital. Life support was terminated less than 48 hours later due to multiple systems failure. Determination of cause of death was complicated by the fact that Troy had Cardio-vascular Disease. 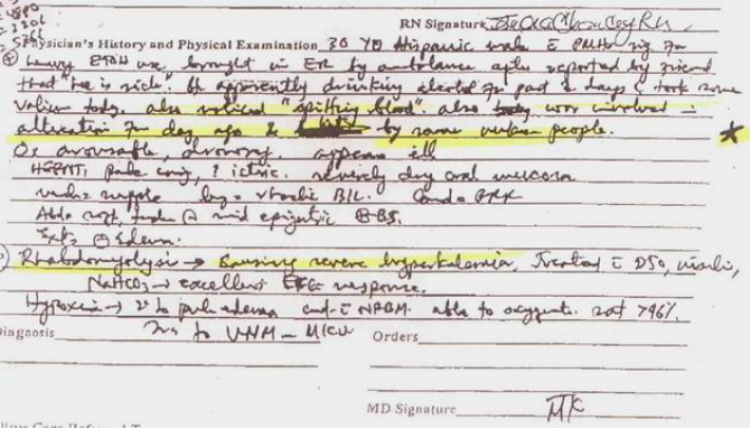 Because of this prior condition, his cause of death was listed by the OMI as from complications of his aspiration pneumonia, which led to multi-organ system failure, most likely secondary to impairment from substance abuse. However, when my husband interviewed the physician who had attended Troy in the emergency room, that doctor stated his belief that the beating Troy suffered in the hands of Edward Lucero and his friend was a gross physical insult that would have contributed significantly to the pre-existing condition and very likely aggravated that condition to a critical limit. In their undated reports, Officers Anaya and Martinez refer to the events of June 7, 2002, as “a disturbance.” Neither of their reports contains the information that Ed Lucero and Paul Gonzales assaulted Troy or that mace was used. To date, the third officer, Anthony Ortega, still has not filed a report. It’s like he wants to pretend that he wasn’t there, and since the dispatch records have mysteriously vanished, (if they ever existed in the first place), there’s nothing on record to prove that he actually was there. Because the police reports were falsified, there would not have been an investigation of Ed Lucero’s assault on our son if he hadn’t been unfortunate enough to die. But, because Troy did die, Patrolman Samuel Stephens of the NM State Police was assigned the task of interviewing witnesses. When questioned by Officer Stephens, both Officer Anaya and Officer Martinez lied, denying that any assault occurred, although Officer Anaya did state that his mace “accidentally” went off. 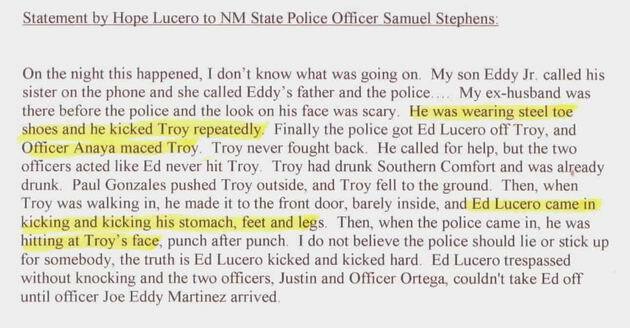 There were seven other witnesses to Ed Lucero’s assault on Troy. Four of them gave statements to the State Police attesting to the assault. Two others refused to become involved by making statements, and a seventh witness - a friend of our family who really would like to help us -- was intimidated by threats of retribution by friends of Ed Lucero if she were to come forward with a statement. 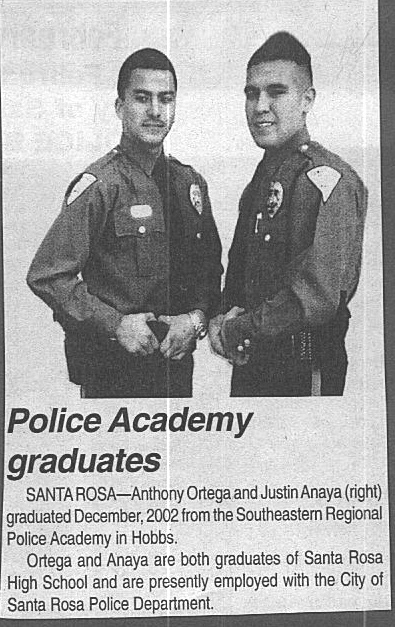 It’s obvious that Officers Justin Anaya and Joe Martinez filed false reports and lied to investigators in an attempt to protect their uncle/best-friend, Ed Lucero. We want Ed Lucero charged with battery, with an investigation into the possibility that said battery strongly contributed to Troy’s death. But the Santa Rosa Police have conspired to make any legal action impossible for us. We can’t even file a civil suit, because criminal and civil charges against individuals can be filed only if an arrest has been made by the police. The police not only refuse to arrest Ed Lucero, but Anaya’s and Martinez’s conspired "cookie-cutter" reports of the “disturbance” (which parrot each other almost word for word) have been deliberately constructed to conceal the fact that any assault took place. The formula for this successful police cover-up seems to be the following: No arrests + no victim taken to the E.R. + no police reports + no dispatch records = THE CRIME NEVER HAPPENED (No Visible Evidence). But the people who loved Troy can’t let this go so easily. Troy’s father was murdered when Troy was six, and I raised my two sons as a single parent with the loving support of grandparents, aunts, uncles and cousins. The loss of “their boy,” who “lit up the room when he entered,” has broken the hearts of that extended family, as well as my own and those of Troy’s brother and stepfather. Most tragic of all, Troy’s daughter has lost a daddy who thought the sun rose and set on her existence. For the past nine months, our family has been waiting for the District Attorney’s Office to act on this case. Our last communication with Assistant District Attorney Joe Ulibarri (Las Vegas) was on January 13, 2003. At that time D.A. Ulibarri told us that he needed to speak with his superior, as his superior was considering closing the case without further action. We agreed to have a telephone conference about this on January 27, 2003. That conversation never took place. Three times we have called the District Attorney’s office to find out why our phone appointment fell through and to set up another one, but D.A. Ulibarri will not return our calls. Is this what the American Justice System is all about? Even if Troy had not died from the events of June 7, he was still battered, was the victim of excessive use of force (mace), and was not given equal protection from an unwarranted assault. Where is the criminal complaint of "battery" and the possibility that it contributed to the death of the victim? Where is the chance for us to file a civil complaint for "denial of equal protection against an unwarranted assault," for "conspiracy and filing false police reports," for "unauthorized surveillance," for "failing to render medical assistance," for "detaining without just cause", for "violating a right to freedom of association" and for "improper police protocol"? Why is there no Police Department's Internal Affairs Report? 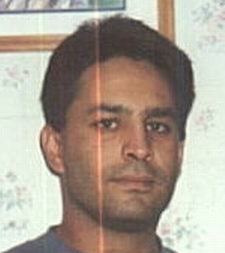 I lost my first husband to an unsolved homicide in Albuquerque, NM, many years ago. 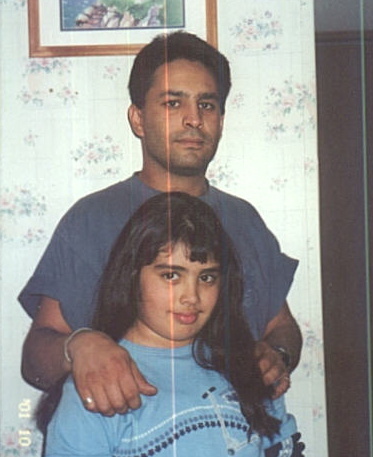 I was helpless to do anything to obtain justice for that loved one. In the case of my son, the possibility of justice does exist, but because Troy’s assailant is the relative/best friend of two police officers, the chance of achieving that justice is being denied us. Today we submitted 297 signatures to the count clerks office to petition the 4th NM Judicial District to convene a Grand Jury. Only 200 were needed, and friends and family alike secured them in a short amount of time. It seems that plenty of citizens have been offended in years past by local law enforcement brutality and intimidation. The petition reads: " .......to convene a Grand Jury to investigate the allegations of battery, malfeasance, conspiracy, falsifying records, evidence tampering, failing to prosecute, dereliction of duty, civil rights violations and any other illegal acts committed by any individual of the Santa Rosa Police Department or individuals associated with the battery and prosecution thereof, in its relationship and/or contribution to the death of Troy Pino."